Marrying in July 2013, Ronnie and Jessica were presented in their first year with the challenges of learning to live together, blending their two very different “styles”, addressing some unexpected financial pressures after the purchase of their new home, and then the tragic passing of Ronnie’s dad shortly after their first Christmas, as the result of a car accident in Mexico. Two beautiful children subsequently joined the family – Swayzie Grace in April 2015 and Lewiston James in May 2016, just 13 months apart. Although Lewiston was a bit of a surprise, they had hoped for a bigger family, and so were excited for their children to be close. They considered themselves exceptionally blessed. 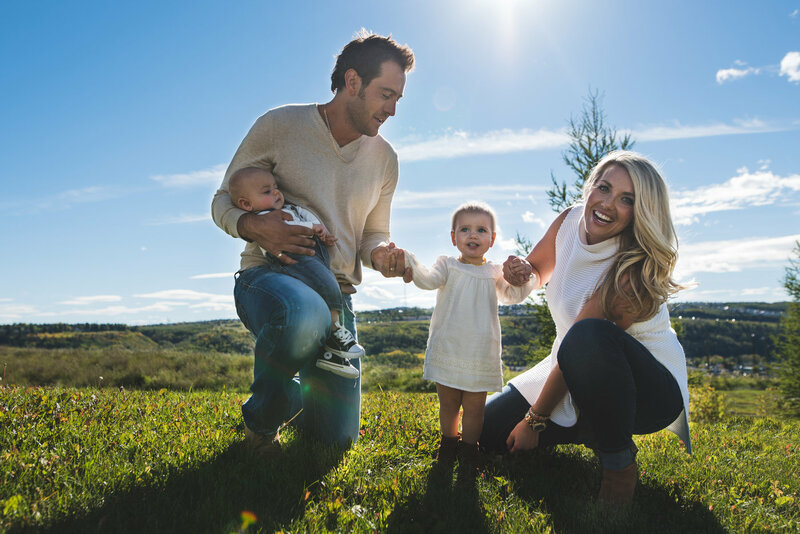 Both pregnancies were normal, with no health concerns, and deliveries at Calgary’s Rockyview Hospital were uncomplicated. Not knowing that either Ronnie or Jessica were genetic carriers of the SMA gene, there were no worries. While they were away on a family vacation in Manitoba 2 months after his birth, Lewiston suddenly appeared limp & weaker. The Olstads pressed for testing and answers in Winnipeg and Calgary as to the cause. On August 11, 2016, they received devastating confirmation that their son was born with SMA – Type 1 (Spinal Muscular Atrophy). He was given less than a year to live. After a hard-fought 4 month battle, Lewiston passed away peacefully in Jess’s arms on November 22, 2016, after his morning bath at the Rotary Flames Hospice at Alberta Children’s Hospital. In response to their unbearable grief and coincidental previous involvement in the SMA community (read the full story here), Jessica and Ronnie created the Love for Lewiston Foundation in their son’s honour, to raise awareness and ensure a lasting legacy for continued positive progress in SMA treatment and research for a cure, newborn screening, and to aid those families struggling with financial and medical care needs, encouraging them not to suffer in silence and isolation. The foundation has become a forum where the Olstads have worked through their grief and shared their journey, being transparent in moving into the future, and inviting others to respond. Their desire is to model and inspire others to live fully, boldly and with joy, in spite of circumstances. They have tried to not ask the question “Why?” but rather “Now what?” This has become their “Now what”. Ronnie is presently a partner and Vice President in 98 Food Co., the umbrella company for Chachis Sandwiches, Dirtbelly, Hula, and DeVille Coffee, food concepts originating locally in Calgary that are franchised across Western Canada. He continues to be one of the driving forces behind LFL. Jess has been a bit of a free spirit. After a career at Jugo Juice where they met, she was recruited to the software business. Realizing it wasn’t her passion, she started independent consulting and continued teaching fitness. She now focuses on the Foundation as they drive towards some very big goals, and also produces a clothing line called The Lewiston Label Inc. that raises funds and spreads Lewiston’s life messages around the community and world.